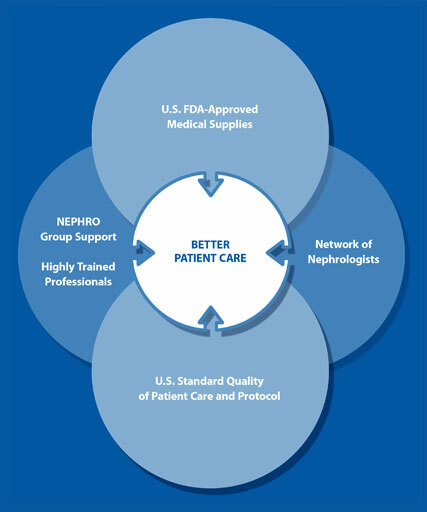 Nephro Synergies is a subsidiary of The Nephro Group, the pioneer in professional outpatient dialysis operations. Since The Nephro Group was launched in 1995, it has become the biggest and fastest growing operator of free-standing dialysis clinics throughout the Philippines. The Nephro Group is headed by medical professionals with over 100 years of combined experience in the renal care industry, both here and in the U.S.
Nephro Synergies works exclusively with hospitals by establishing full-service dialysis centers on the premises. By doing so, hospitals can concentrate on the overall care of the patients, while Nephro Synergies can focus on their dialysis needs. Our clinics are equipped with Fresenius dialysis machines. We use only U.S. FDA-approved equipment and medical supplies and we employ a highly trained nursing and technical staff so that our partner hospitals feel confident that their patients are in capable hands. At Nephro Synergies, we understand how chronic kidney failure can affect people’s lives and that is why it is the company’s mission to provide Filipino renal patients with high quality, accessible and affordable dialysis treatments.